Cadillac is trying to seriously take over the luxury car industry by offering something awesome in each and every category. As part of a $12 billion investment program that will showcase eight new vehicles from now to 2020, Cadillac is heading down a bold path that brings style, grace, elegance, sophistication and a lot of attitude to the entire lineup. 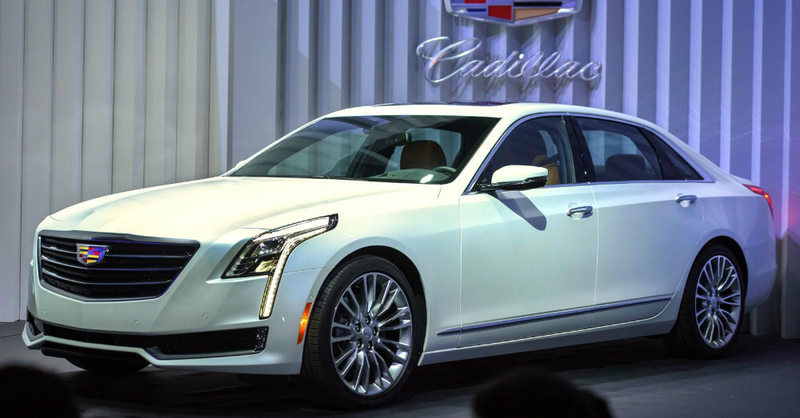 As with anything that is going to start giving a huge return on the investment, Cadillac will begin with the new flagship sedan in the form of the 2016 CT6 which is truly a major advancement in large luxury sedan driving. This awesome new Caddy is built with three highly focused goals in mind presence, elegance and technological innovation. All the new Cadillac models, whether it’s a next generation or a brand new offering, will carry in performance oriented proportions and seriously bold features but the CT6 will offer a new face that gives the grill a great look along with vertical LED light blades and standard Indirect Fire LED headlights. To keep up with the technology and material changes of many automakers, the CT6 will feature almost all aluminum body panels and an all-new aluminum stricter that allows the car to be over 200 pounds lighter than it would be when built with a steel frame. Some of the best parts of having a structure and body built with aluminum is the added rigidity and noise reduction to make the cabin much quieter than with previous material uses. Even though the CT6 is 211.4 inches long and has a 204-inch wheelbase the car is basically the same weight as a mid-sized car allowing the CT6 to be much more agile than it would be a the full weight, making this change of materials one of the most impressive and beneficial features of the car. Not only will the weight reduction offer the car the ability to be more agile, the use of aluminum-intensive suspension parts give the CT6 a better ride feeling. The CT6 will offer both RWD and AWD to aid its drivetrains with the AWD being standard on all V6-powered models. Adding to the driving dynamics the Active Chassis System adds Magnetic Ride Control which has been advanced and improved by Cadillac over the past several years to be a class-leading feature offered on several different Cadillac models and now on the CT6. To power this large luxury beast, Cadillac has chosen three amazing engines that will give the car plenty of power to create the performance desired. This will start with the 2.0-liter turbocharged direct-injected four-cylinder engine that offers 265 horsepower along with a 3.6-liter naturally aspirated V6 that offers 335 horsepower and at the top of the line the 3.0-liter twin turbo V6 that pushed out 400 horsepower and 400 lb.-ft. of torque. The two V6 models take advantage of cylinder deactivation technology and all three use an eight-speed automatic transmission to help bring their fuel mileage numbers up to a respectable level. Plans are in place to have a V8 added to the lineup later in the life of this generation of the CT6. All these awesome features we have already discussed are great, but what makes a Cadillac is the absolutely pampered feeling you can enjoy inside the car. Cadillac did not forget this part of the equation and offers some of the most amazing features for owners and passengers to enjoy when riding this new large flagship automobile. With this in mind, the CT6 shows up with premium leather upholstery, exotic wood and carbon fiber elements, cut and sew detailing that has become the signature of Cadillac interiors, a quad zone climate control system with four individual controls, a 10.2-inche CUE multimedia screen, the OnStar 4G LTE Wi-Fi hotspot feature, front seat massaging, reclining rear seats, and a 34-speaker Bose Panaray premium audio system and a rear seat entertainment system with dual ten –inch screens. Of course a car of this level will also include the highest level of driver assistance features including the 360-degree camera giving front and rear views, a video streaming Rear Camera Mirror, an Auto Vehicle Hold function that prevents rolling on an incline, an Enhanced Night Vision system, pedestrian collision mitigation, advanced parking assistance and automatic braking along with the usual luxury driver aids that help make the CT6 one of the most advanced vehicles to come out in a long time. Having a new flagship model puts the pressure on an automaker to ensure the vehicle offers everything anyone shopping in this class will want and it appears Cadillac has done a masterful job of making sure the CT6 will be everything needed and more. If you are looking to buy a new large luxury sedan, the CT6 will make one of the best choices on the market as it is offered for the first time during the 2016 model year for your driving enjoyment. Why Should You Buy a Chevy?